Jump24 - A development studio who are passionate about creating beautiful things. Jump24 - A development studio who are passionate about creating beautiful things. Jump 24 is a young, dynamic development studio made up of experienced and exceptional people. We are based in Birmingham and specialise in designing and building high quality web applications and fully responsive websites for clients according to their individual needs. We enjoy a challenge and produce fantastic results, as previous clients would testify. We may be small, but the results are big, and the benefits to each client are vast. Our diverse backgrounds are the perfect cocktail, coupling many different skills and experience to get perfectly polished results. 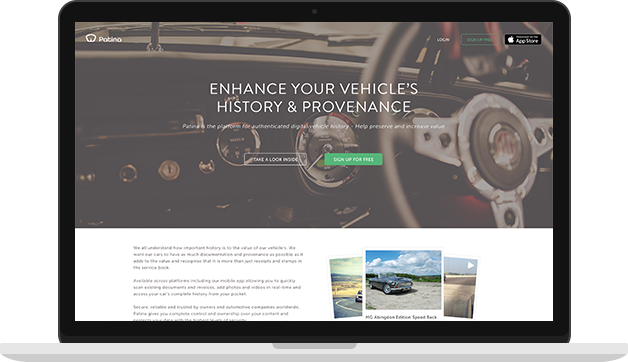 Patina is the digital platform for car history, helping users to preserve and enhance the history of their cars in a secure digital record. Initially available on mobile only, we were asked to design and develop a web platform that allowed the viewing of content shared from mobile devices. Since this first web release, Jump have been totally responsible for the Patina web platform, developing it into an app that is used globally by tens of thousands of car enthusiasts.